Hello blog friends. I am happy to say that I finally finished knitting the cowl that I started making back in the fall. I finished this in the middle of January but I did not get a chance to share it on the blog until now. I originally wanted to knit this into a large scarf for myself but I got a little bored knitting it. I figured out the solution and I decided to make it into a cowl. Does that ever happen to you where you get bored making something? I find for myself the seed stitch a little tedious. 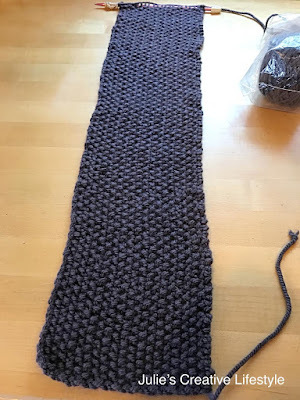 I will have to find a knit stitch that I like better for my next scarf I make. You might remember me mentioning about this scarf and this yarn from this post I did HERE. I knitted this cowl in the seed stitch and cast on 21 stitches. I used 9 US or 5.5 mm needles. 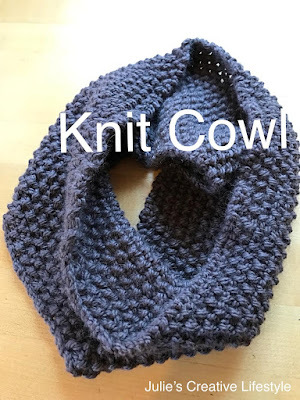 The cowl is 25 inches long and 6 1/2 inches wide. I folded the cowl in half and then sewed up the two sides together to form a cowl. This is what the knit cowl looks like. I am so happy I finished knitting the cowl and I enjoy wearing it with my outfits and different coats. I still have two more skeins of this yarn left and at some point I will probably make myself crocheted handwarmers. Do you have any finished projects on your needles? Thanks for stopping by and have a nice week and weekend. Don't forget to visit our Monday Cooking and Crafting with J & J Link Up. Unfortunately I don't knit but I love seeing your creations. This cowl is so pretty and I bet it's keeping you warm right now! 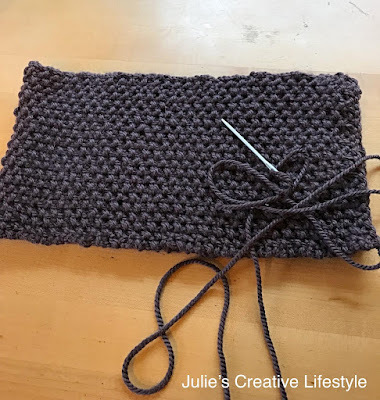 I love seeing your finished product Julie! Also the color of this cowl is nice too. It’s been awhile since I’ve been here but miss your posts. Have a wonderful Wednesday. Oooooh, your finished cowl is a work of art, my friend! Love the color and pattern. This is lovely! If I was going out on this snowy day, I'd love to wrap myself in this. Take care and stay cozy. Good idea for a quicker finish. I have a few projects started but none of them finished. Knitting projects go really slow for me. Many many years ago I knit I have no idea where they are now, but have fond memories wearing those. The stitch is immensely attractive. 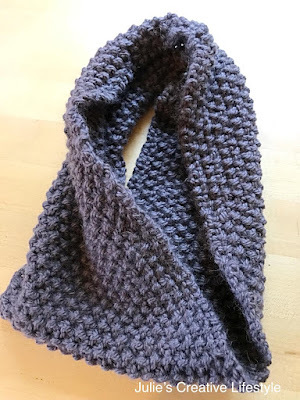 Your cowl is gorgeous! I love the color and I think that you came up with a fabulous solution! I am off to pin since all I know how to make is a scarf, but I think I could close one up and make this!! 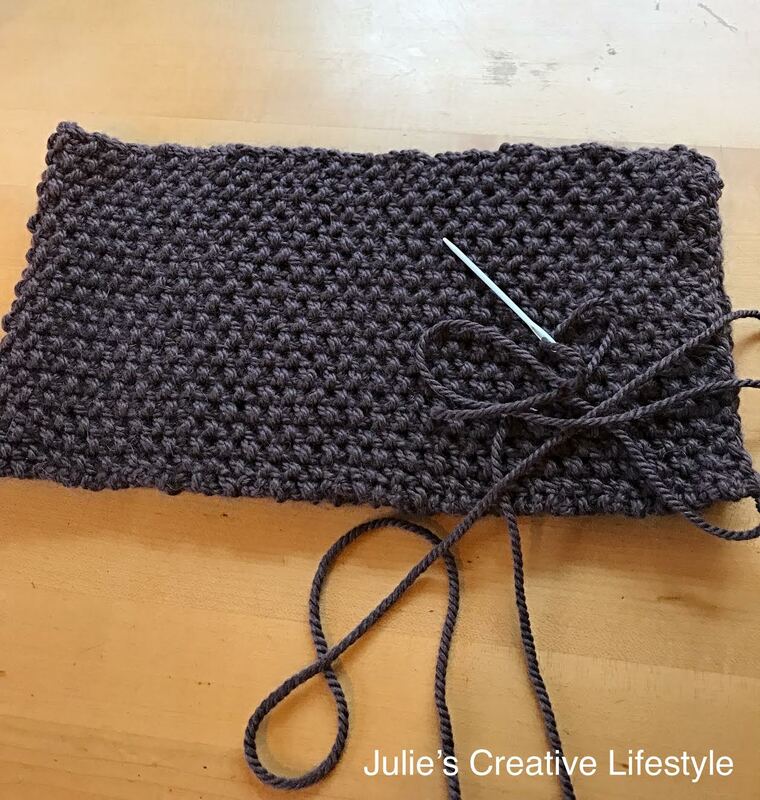 Love the color Julie! It's a color that is flattering for nearly everyone...light hair, dark hair, blue eyes or brown! Love to see your talents Julie. This one is pretty and a great color. I have been wearing my pretty white scarf and love it. I am so glad you have continued to enjoy crocheting. It is becoming a lost art. So it is good to see that you still enjoy creating beautiful knit and crochet pretties. Have a wonderful day. It looks beautiful! I'm sure it's very warm too. I have a spring cardigan on my needles, but it's still very cold to wear it. Although the seed stitch is tedious it looks so pretty when finished. I love the color of your cowl and I think you may get another few weeks of wear out of it!! It turned out so nice Julie. I love the color! Thanks for sharing it with SYC. It's adorable. I really wish that I could knit. Thanks for linking up to Keep In Touch.